Flowers: Family of Five. : Madelyn is One! It was a year ago, at 1:00 AM, a full month before Madelyn's due date, that Angie woke me up from my deep sleep and told me, "My water just broke." I remember physically jolting, as if I'd just been shocked, because my body felt like it should do something with the unexpected news but didn't know what to do. Now that Angie's water had broken, we knew we would have a daughter in the next 24 hours. Our whole world would change and our family of three would grow by one. Angie's water breaking before the onset of contractions wasn't new to us. This is exactly what happened with Patrick (although this time, luckily, we at least had electricity) so we weren't quite as flustered as we were the first time around. We called the hospital to let them know, both took showers, then went back to bed to try to get as much rest as we could before we drove in to start the process. As we drove away in the morning, we realized the next time we'd see our house, we would have a daughter. 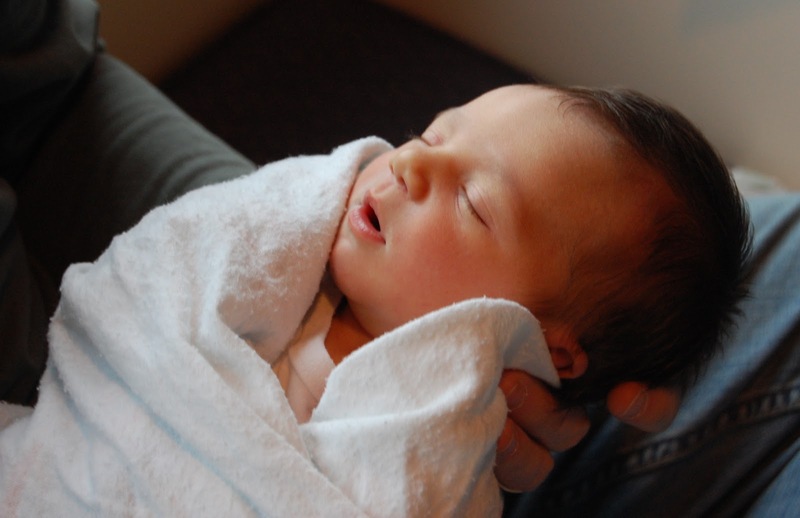 Our main concern was Madelyn's health since she was just a couple days shy of being officially "premature." Most of that worry was replaced by excitement once we got to the hospital and the nurses told us all Madelyn's vital signs looked good. They ushered us to our room and we anxiously waited for Madelyn's arrival. Friends and family visited, we wondered what she would look like, what she would smell like, how much she would weigh, if she'd have hair (answer: YES) and a million other things. The day seemed to take forever with dilation happening slower than anyone wanted. Then, all of a sudden, the doctors went from telling Angie "you might have a few more hours of labor" to "time to start pushing!" This was it. With everything happening in slow motion - seconds feeling like hours - you would think that I'd have taken careful mental notes of each detail, each word, each site as they happened around me. I should be able to recall everything about those last moments of labor; especially since I wasn't even the one in labor. But I can't. It all blends together into one big experience with a few details sticking out here and there. I remember having a sense of pride in Angie for what she was doing. What she was capable of. The same pride I felt when she delivered Patrick. It came back like an old friend and I couldn't help but tell her how much I love her and squeeze her hand tighter than she probably wanted right then. I remember Grandma, Meme and Abbie sitting in the room with us, holding their breath each time Angie pushed and offering words of encouragement as we all exhaled and prepared for the next round. I remember each time Angie pushed, the room grew more excited and more tense; just waiting to hear Madelyn's cry. Waiting to see her face, touch her skin, look in her eyes and do everything we could to let her know right away that she is loved beyond imagination and she is safe with us. Wishing that with just a touch we could let her know, "we are your Mom and Dad and we will love you and take care of you forever." And then it happened. Madelyn Claire Flowers took her first breaths at 3:26 PM. She weighed just 6lbs 7oz and was 20.5 inches long. And she was perfect. Absolutely perfect. Her next few days at the hospital were wonderful and her introduction to Patrick went better than we could have hoped. Over this last year with Madelyn, we've gotten to know her very well. She has more personality and attitude than any one year old I've ever met. She is infinitely sweet. She can say more with one look - whether it's a smile or a glare - than a hundred words could convey. She knows what she wants and she will tell you, in no uncertain terms, exactly what it is. She LOVES to hug. She's one of the best cuddlers around. She is tender. She loves and admires her older brother. She can fall asleep at the drop of a hat. She drinks faster and more than any baby I've ever seen. She's incredibly independent and is happy to walk around entertaining herself without you if she feels like it. She climbs everything. She has a talent for knowing the exact moment you're unable to see her and immediately taking advantage of that. Her squeal and sweet smile can fix everything. She's gorgeous. She knows that. She is incredibly loved and we cannot imagine life without her. There is not a day that passes that we don't stop and thank God for our Madelyn. Happy Birthday beautiful girl! You have brought so much happiness to all of our family. Video is a wonderful reminder of all of the special moments. Beautiful--the video is great, Toby! Happy birthday, Maddy-Cakes! We love you so much and are so proud of your first year. We can't wait to keep watching you grow and learn! Such a sweet post and video. Happy Birthday! I can not believe that Maddy is one! Such a beautiful and loving blessing she is to me and everyone! I am so thankful for our Maddy! 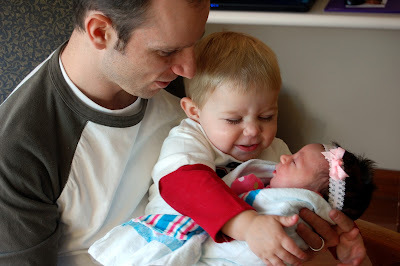 Wonderful capture of the special moments of Maddy's first year! Happy birthday Madelyn! I love you so much! How beautiful this is. Sweetness is just all over Maddie!